A powerful new imaging technique called High Definition Fiber Tracking (HDFT) will allow doctors to clearly see for the first time neural connections broken by traumatic brain injury (TBI) and other disorders. Much like X-rays show a fractured bone, this technology will allow clinicians to observe and compare the integrity of 40 fiber tracts or cables across the brain. These tracts, much like the bones, are the support structure for brain functioning. In the past, damage to this support structure has been difficult to see. HDFT allows seeing the break, quantifying the damage (percent of axons likely lost), and tracking that areas of the brain have lost connectivity. Neurosurgeon David Okonkwo and Clinical Director Brain Trauma Research Center states "We have never had a neuroimaging modality that actually tells us what’s wrong. 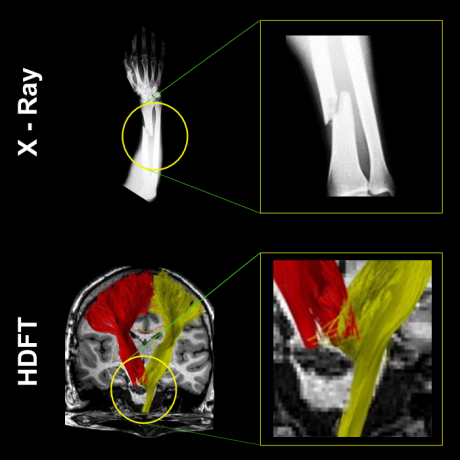 With HDFT we can pinpoint the exact location of injury. That carries enormous implications for diagnosis, prognosis, and rehabilitation . It is a game changer."